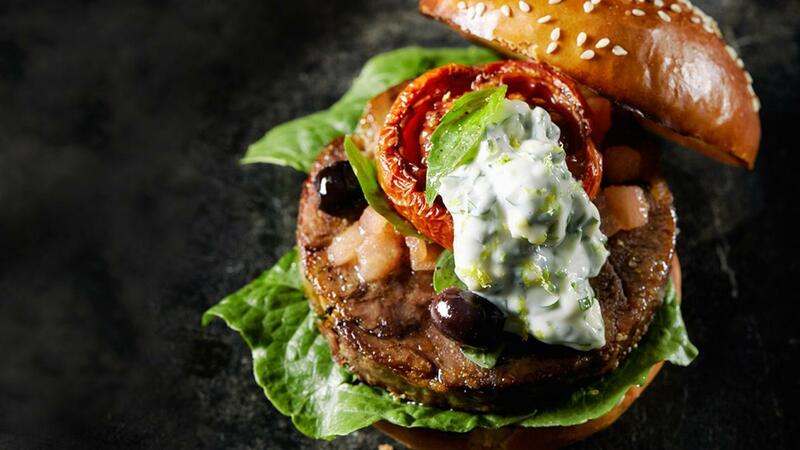 A sophisticated and creative take on a traditional burger, this is a recipe by Dutch chef Anne Zantinge. He braises the veal shank and presses it when still warm into a round mould, making a real gourmet burger. Chop the carrot, the onion, the celery and the garlic. Fry in olive oil on low heat and add the meat. Deglaze with the wine and add the chicken stock. Braise the meat on a low temperature until very tender - about 2,5-3 hours. Pull the meat and press it into ring moulds while still warm. Leave to cool - this way the gelatine in the meat will solidify and the burger will keep its shape. Half the Roma tomatoes, drizzle with olive oil and sprinkle with salt and pepper. Dry in the oven on a low temperature. Finely chop the flat-leaf parsley and the garlic and mix with the mayonnaise. Add lemon zest, lemon juice and black pepper. Dice the beef tomatoes, discarding the interior. Mix tomatoes and shallots with the vinegar, salt, olives, olive oil and pepper. Season the burgers with salt and pepper and cook the burger on both sides on high heat until crispy. Slice the burger buns open, spread butter on them and grill cut side down on a skillet. Build the burgers: put the burgers on a leaf of Romaine lettuce. Put a tablespoon of salsa and an oven-dried tomato on each burger. Finish with gremolata-mayonnaise and garnish with fresh basil leaves.